Prevention and treatment are on top of mind for those who play sports or live an active lifestyle. Avoiding injury is often easier said than done and when injuries occur, a wrench is thrown into your regular routine. Our pre-soaked cotton wraps are unique and effective solution for wellness, health and recovery, based on pure and premium organic essential oils within the patented CO2 Complex and substances of Dead Sea mud. Active and powerful components of different wraps stimulates the blood circulation and increases blood flow, forcing more blood through the capillaries and thereby improving metabolism in muscle tissues and organs. Capillaries, the smallest blood vessels in the human body, are responsible for transporting nutrients, oxygen and wastes to and from body tissues. During the wrapping session, due to increased volume of blood flow in the capillaries, more oxygen and nutrients deffuse into the tissues and metabolic residues and toxines will be removed, promoting better and faster muscle and overall recovery after high physical activity. – Good stress reliever and can help lower blood pressure. We recommended to design a course of wrapping treatments, combining different effects of heating and cooling wraps, in aim to have better results and include some lymphatic and / or sports massage or a similar procedure to treatment course. In most cases we recommend design the recovery or treatment courses starting with THERMO wrappings. In cases of serious injury or consult with your therapist or doctor before you start with wrappings. depend on the athlete’s condition (overtraining, injury , muscle etc.). A speedy recovery is crucial for athletes and exercisers alike. Heating injured muscles can produce an increased blood flow, similar to that seen during exercise. Thermo-wraps can provide a doubling of the blood flow rate in your core, organs, arms and legs, also known as the periphery. This increased peripheral circulation can reduce inflammation, decrease pain and speed up healing – the important steps in helping the body recover from strenuous activity. During the thermo-wrapping session blood flow can increase and this is important because blood brings oxygen and nutrients to tissues and cells. It’s also important because heating the muscles can produce an increased blood flow, level similar to that seen during exercise. Thermo-wraps can also reduce stiffness, pain and inflammation that are often caused by overtraining or arthritis. Cooling effect of CRYO wrappings or lighter cooling effect of DETOX wrappings provide moderate surface cooling to help reduce swelling and muscle fatigue without minimizing the natural healing process or interfering with the process of lymphatic drainage. Vasoconstriction is never a concern because they are not frozen. Our wraps are easy to use tools for “cool-down” and aid in faster recovery after training or competition. Athletes have been conditioned that “cold therapy” means that “something” frozen must be against their skin to numb the pain. Effective “cryotherapy” isn’t measured by masking or numbing pain, but rather how it affects the recovery process. Many trainers and doctors believe that icing actually slows down the recovery process as it affects blood flow and nutrients from reaching an affected area. Moderate surface cooling is a version of “cryotherapy” that does not affect blood flow and helps to accelerate recovery. Our CRYO and DETOX provide hours of non-irritating relief compared to short periods of numbing. 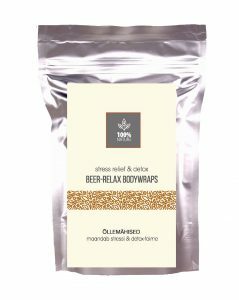 BEER-RELAX wraps has light cooling effect, but they are one of the easiest ways to reduce the oxidative stress and enhance your immunity is to fight free radicals and support your immune system. We recommend to apply THERMO-BUTTER cream prior the wrappings to leverage and intensify the effect of wrappings. At least 5 to 10 procedures will be good to combine for better results. THERMO WRAPPINGS FOR ATHLETES From hot baths to heating pads to hot water bottles, heat therapy is a well-known remedy to help ease muscular pain, and reduce soreness and inflammation. THERMO wraps active components and patented CO2 complex increase the blood flow volume and “push” more blood into the capillaries, providing more oxygen and nutrients to the tissues. 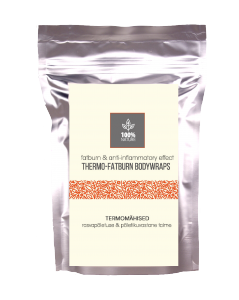 In addition, THERMO wraps promotes thermogenesis, the process of heat production in the body, and increases metabolism in many tissues and organs. These effects of THERMO wraps provide a better and more effective recovery after hard training loads. Active ingredients: Natural Dead Sea Mud Extract, Patented Anti-Cellulite CO2 Complex, Natural Menthol, Natural Camphor, Natural Caffeine, Natural Essential Oils: Peppermint, Grapefruit, Sweet Orange and Lemon. BEER-RELAX BANDAGES / ANTISTRESS Beer wrapping accelerates metabolism, regulates sweating and stimulates fat burning, improves skin elasticity, helps in treatment of acne. B vitamins and microelements contained in malt improve the immune system and body resistance, which is manifested in decrease in incidence of seasonal colds. Wrappings strengthen joints, warm up muscles, remove muscle tension, a sense of fatigue and, thanks to a mild soothing effect, perfectly relax. Beer wrappings are effective way for reducing oxidative stress caused by overtraining or high training load and intensivity. Ingredients: extract of Dead Sea mud, natural menthol, natural camphor, rye malt, barley malt, concentrated malt-hop extract. CRYO WRAPPINGS boosts the lymphatic system thanks to their strong cooling effect, enhances lymphatic drainage and helps to excrete residues and toxins from the tissues and body. Help to shed excess fluid, strengthens the walls of the veins, improves skin texture and tone. Allowed to use in case of vascular extensions and during pregnancy to ease swelling in lower legs and feet.. Best results will be achieved by combining Cryo, Thermo and Detox wrapping procedures in a treatment course. Active ingredients: Natural Dead Sea Mud Extract, natural menthol, natural camphor, collagen, allantoin, mixture of natural essential oils: peppermint, green mint and lemon. 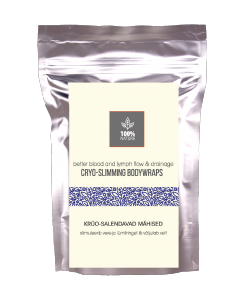 DETOX WRAPPINGS have a cooling effect that enhances lymphatic drainage and helps to excrete residues and toxins from the tissues and body. Helps to shed excess fluid, improves the texture and tone of the skin. Active ingredients: Natural Dead Sea Mud Extract, Natural Menthol, Natural Camphor, Natural Caffeine, Essential Oil Blend: Peppermint, Grapefruit, Sweet Orange. 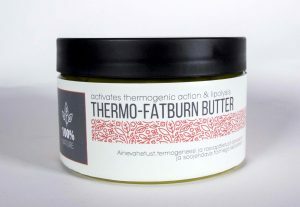 THERMO-BUTTER activates metabolism, stimulates the blood circulation and enhances lymphatic drainage. Active ingredients of butter has a fairly strong effect, it works for several hours after the procedure, stimulating metabolic processes and blood circulation. Using within wraps promotes better results and enhances effect of wrapping treatments. Active ingredients: jojoba oil, wheat germ oil, lemon wax, caffeine, red pepper oil CO2 extract. WRAPS APPLICATION: clean and peel the skin. Apply wraps on problem areas and cover with plastic. Leave wraps for 30-40 minutes. Remove wraps and apply some organic moisturizer cream if needed. It works well with lymph or other drainage massage procedure. After the wrapping procedure (depending on the size of the body), the reduction in dimensions may be up to -4 cm. BUTTER APPLICATION: apply a small amount of butter on problem areas with light massage movements. To increase the slimming effect, cover these areas with a film. Leave on for no more than 30-40 minutes. If necessary, wash off after treatment. For best results apply the butter prior the Cryo and Detox wrapping procedure. CONTRAINDICATIONS – Individual intolerance of the active components, allergy to citrus or caffeine (see product ingredients); – Cancers, high blood pressure and risk of thrombocytopenia (consult with doctor): – Do not use for open wounds or in case of other serious injuries.